Green Cotton has been around since 1986, when founder Leif Nørgaard acquired an interest in the environment and textiles, before many others had even thought the thought. Throughout all these years, the company behind Green Cotton - Novotex - has received an impressive number of awards as proof of the serious work we have done to make the textile industry more environmentally friendly. Among other things, we received a prize for helping to grow the first cotton ever to be certified by an independent institute. 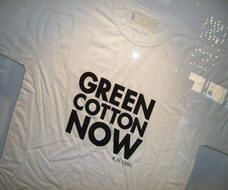 From this cotton, we made the world’s first T-shirt made of certified organic cotton, which Katharine Hamnett designed in 1991. Today, by Green Cotton is certified in accordance with ISO 9001 (Quality Management) and ISO 14001 (Environmental Management). The company is also certified by GOTS, Oeko-tex 100 and the EU Ecolabel. Green Cotton stands behind three children’s clothing brands that can be purchased here in the webshop. Fred’s World by Green Cotton and Müsli by Green Cotton. Clothes for our little ones must be smart and durable. And when the clothes are also made of organic cotton, environmentally-produced and free from harmful chemicals, it's even better for both parents and children. The clothes are designed with a Scandinavian approach to child development. There aren’t so many princesses and princes, but instead active children who want to live life in practical but clever clothes. Clothing from both brands are GOTS certified - the strictest labelling scheme on the market today. Our rainwear is Oeko-Tex certified and our outerwear is Bluesign.